Woman with a Parasol – Madame Monet and Her Son (also known as The Stroll) is Claude Monet’s impressionist oil-on-canvas painting that shows his wife and son on a stroll on a windy summer’s day. The symbolism in this painting is simple, but interesting. 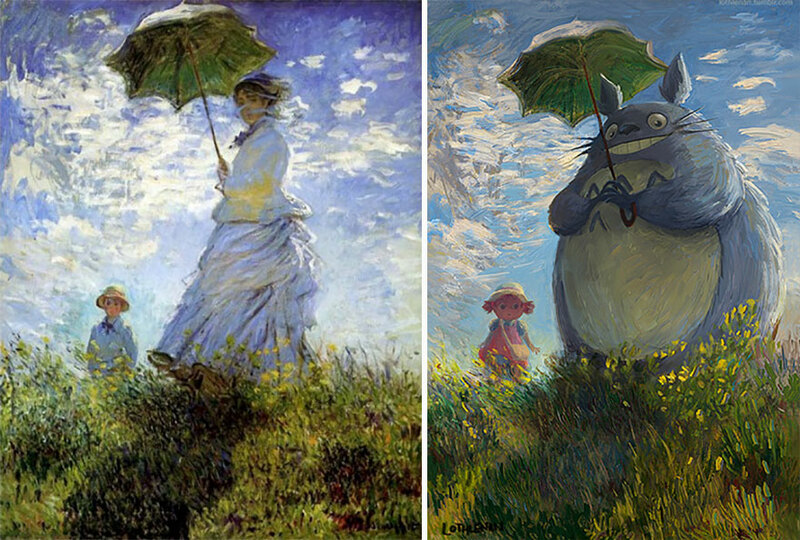 The parasol, the veil, and the dress of Madame Monet are indicators of status, despite the fact that Monet’s family was far from rich at the time. The parasol is also a symbol of protection. Monet did not like the industry and city among which he grew up, therefore, he uses the landscape and light colors of a countryside to contrast all that. Le Printemps (or Springtime) is an oil-on-canvas painting from mid-19th century done by French Classicist artist Pierre Auguste Cot. 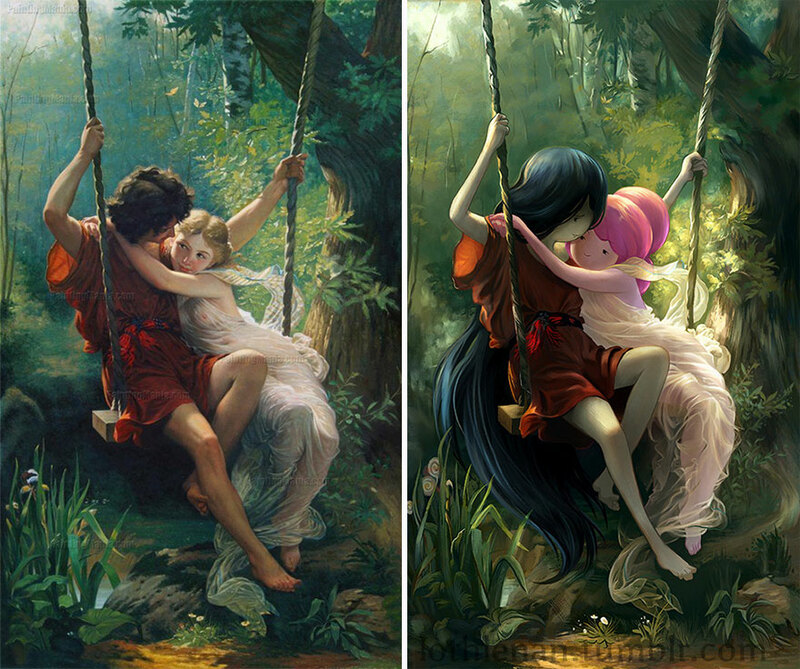 It depicts a flirtatious duo enjoying their time together on a swing. Inspired by Neoclassicism and Romanticism, Cot was famous for creating lushly sensual artworks, and is celebrated for his historical and mythological paintings, in particular ‘Le Printemps’ (Springtime) and ‘The Storm’. Having studied under a handful illustrious artists at L’Ecole des Beaux-Arts, Cot was highly in demand among Paris aristocracy who wanted him to paint their portraits. 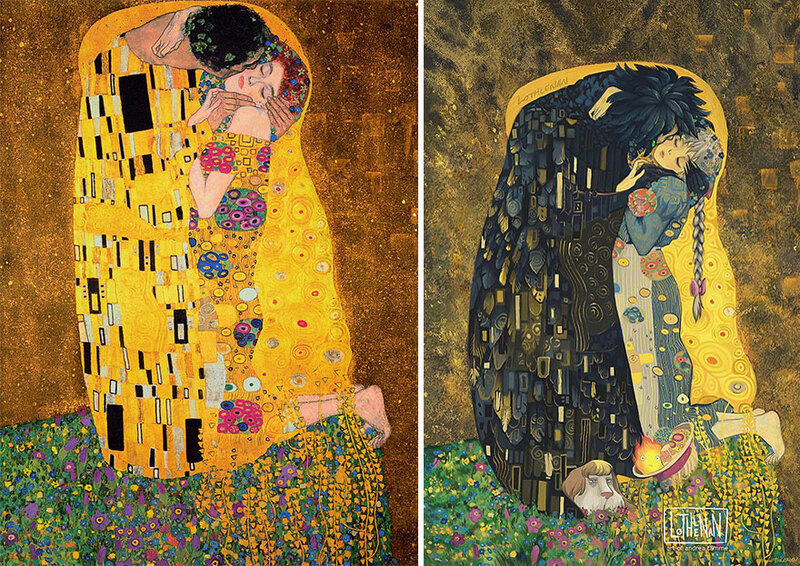 The Kiss is an oil painting, with added silver and gold leaf by the Austrian Symbolist painter Gustav Klimt. It was painted during the height of Klimt’s “Golden Period” (1907-1908). Despite both subjects of the painting wearing clothes, the post-Victorian society of the early 20th century viewed “The Kiss” as a pornographic artwork. On the other hand, some considered paintings such as “The Kiss” to be sacrilegious because of the incorporated gold leaves – a practice influenced by the gold-detailed religious art of the Middle Ages, as well as, the Byzantine Empire. 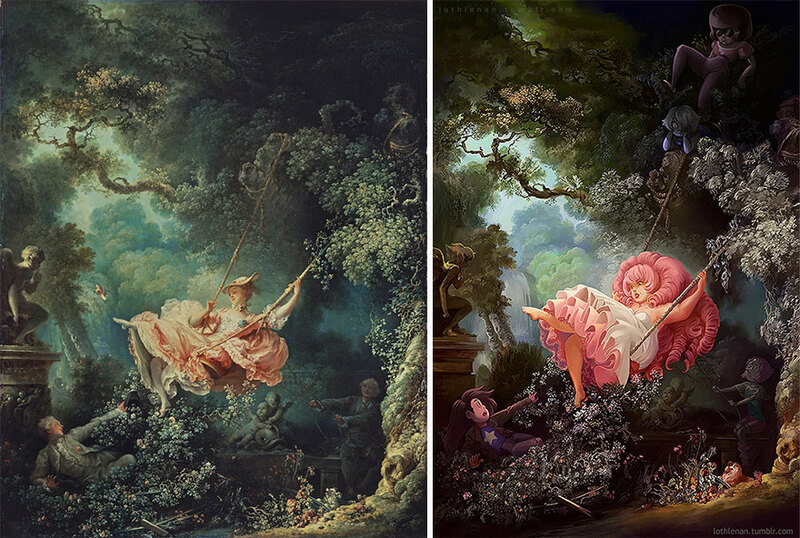 ‘The Swing’ painting (also known as ‘The Happy Accidents of the Swing’) by Jean-Honoré Fragonard is considered to be one of the rococo era masterpieces and artist’s best known work depicting the mistress of the Baron de Saint-Julien. In the 18th century, the painting was regarded as a sexual metaphor due to its suggestive composition. The center-piece of the painting – the girl – is pushed on a swing by her husband while a lover watches from the bushes. Another important detail in the painting is the girl’s lost shoe, a symbol that often indicated the loss of innocence. 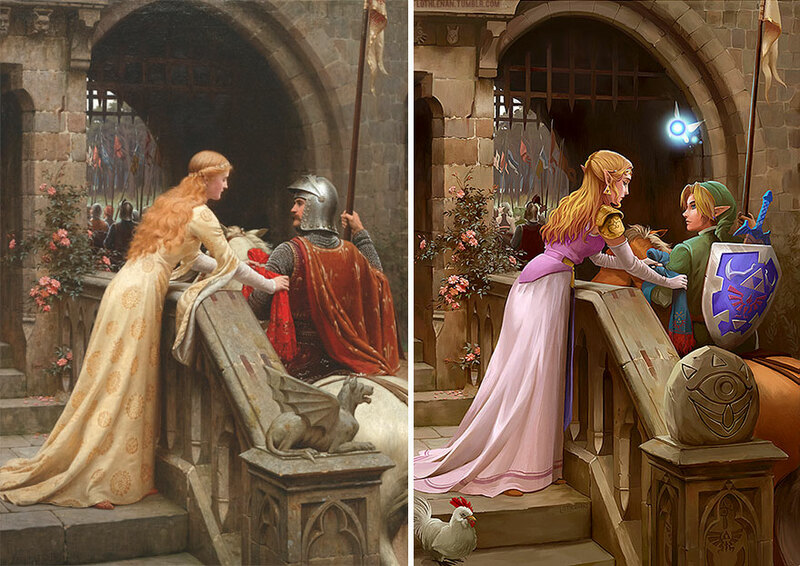 The Accolade by British artist Edmund Leighton is one of the most recognizable paintings of the 1900s which depicts the subject of chivalry. Leighton was a pre-Raphaelite artist who studied and exhibited at the Royal Academy Schools. He was known for his meticulously crafted, romantic medieval scenes that featured long, richly-colored dresses – often times the focal point of his works. 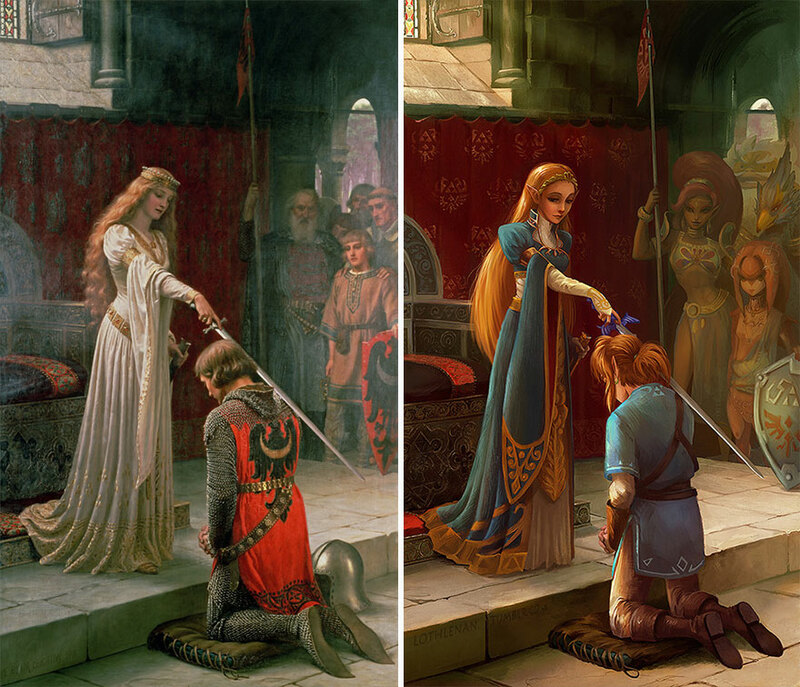 The Accolade is a romantic depiction of a time when kings and queens reigned supreme, and knights rescued their damsels in distress. God Speed by Edmund Leighton is an oil-on-canvas painting which portrays an armored knight departing to war, as he leaves his beloved behind. She, in turn, ties a sash around his arm, a customary tradition of wishing luck during those times. A sash is a symbol of their unbreakable bond and hope that they will be reunited eventually. 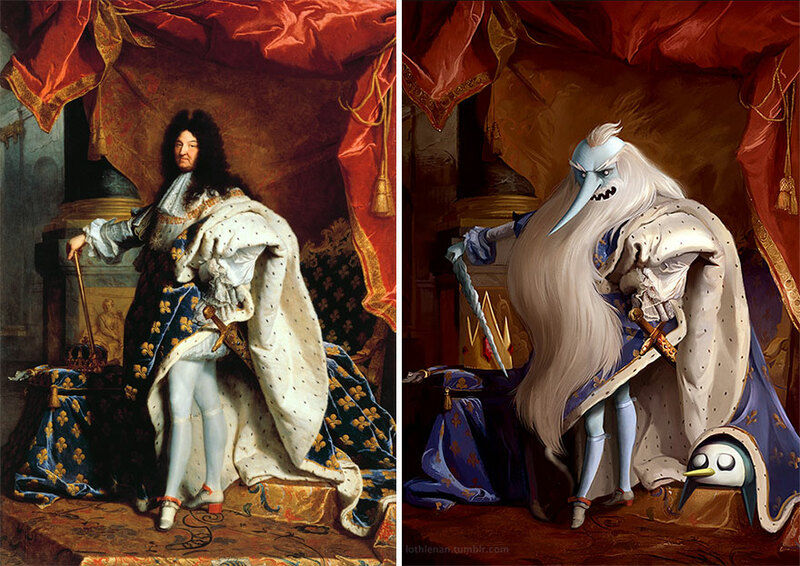 Portrait Of Louis XIV is an oil-on-canvas painting by French painter Hyacinthe Rigaud done after he was commissioned by the king who wanted to fulfill his grandson’s desire of a personal portrait. At first, it was commissioned as a gift for Philip V of Spain, but due to its success and immediate popularity at court it was never shipped to Spain. The details of the painting – the regalia of the antique setting, the crimson curtain and the grace of the Sun King in his coronation robes embroidered with the royal fleur de lys – command an absolute power of the monarch. In this oil-on-canvas painting Vigée Le Brun paints herself together with her daughter Julie. 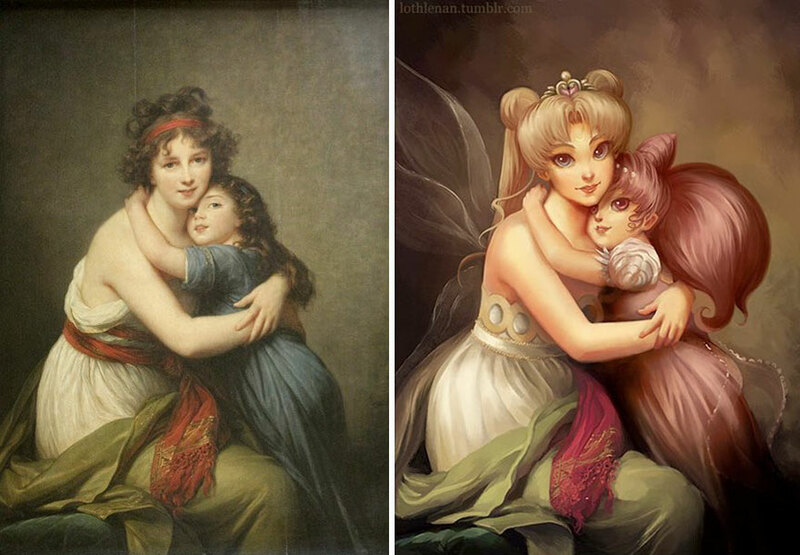 Vigée Le Brun combines the stoic Neoclassical style with an intimate relationship between mother and daughter, which is accentuated by a bare skin-to-skin contact of both painting’s subjects. The extreme proximity creates an illusion of the two appearing although as one. Unfortunately, their close relationship faced a hardship during they stay in Russia. They were reunited shortly before Julie’s early death in 1819. 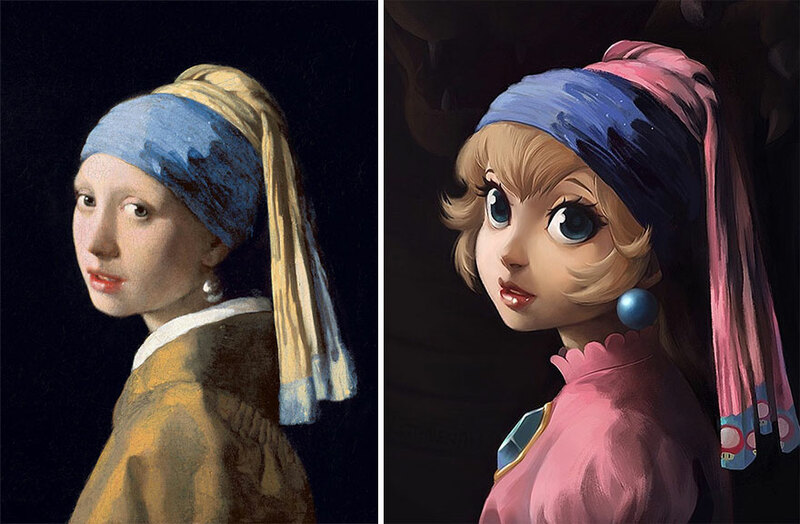 Girl With A Pearl Earring is an oil-on-canvas painting by Dutch Golden Age painter Johannes Vermeer. It is a tronie, which is a 17th-century Dutch description of a ‘head’ not entirely meant to be a portrait. The painting portrays a young imaginary woman clad in an exotic dress accentuated by a very large pearl earring. Uncharacteristic to Vermeer’s subjects, the protagonist of this painting is not depicted doing a daily chore. Instead, it is a glimpse of a fleeting moments, as she turns her head over her shoulder, and parts her lips as if about to speak. 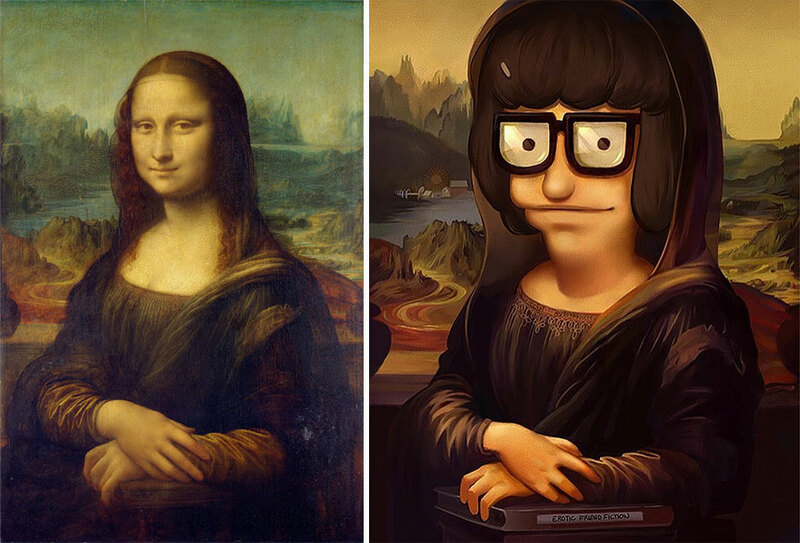 Mona Lisa is the most famous painting by the Italian Renaissance artist Leonardo da Vinci and is considered to be one of the most valuable paintings in the whole world. It depicts a beautiful woman, dressed in the Florentine fashion of her day, and seated in a mesmerizing, mountainous landscape. The painting gained an universal fame due to Mona Lisa’s expression, which seems alluring yet distant. Before Leonardo da Vinci, portraits had lacked mystery and true emotions which would make the portrait realistic. 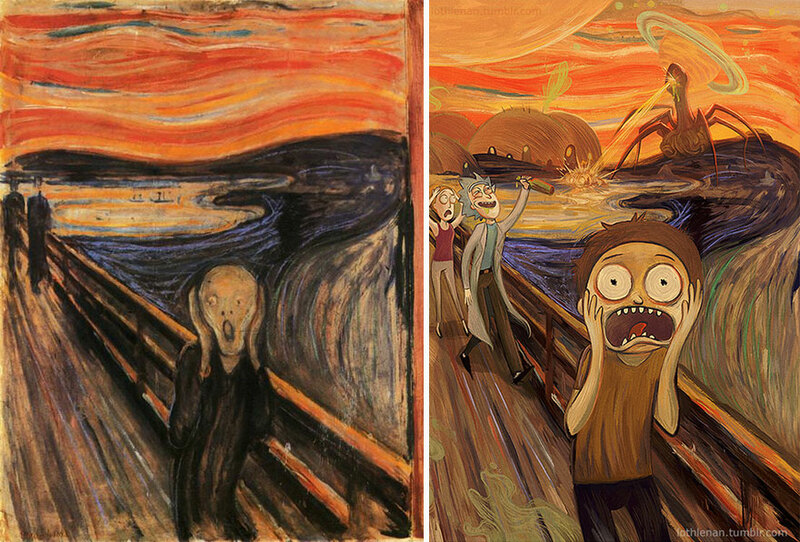 Even though, artists gave a lot of effort they could only show outward appearances which seemed to lack person’s soul, or if they represented soul, they tried to express it through symbolic objects or gestures. Therefore, the Mona Lisa was (and still is) a controversial painting that makes her a living enigma as you can see her soul but it is inaccessible. 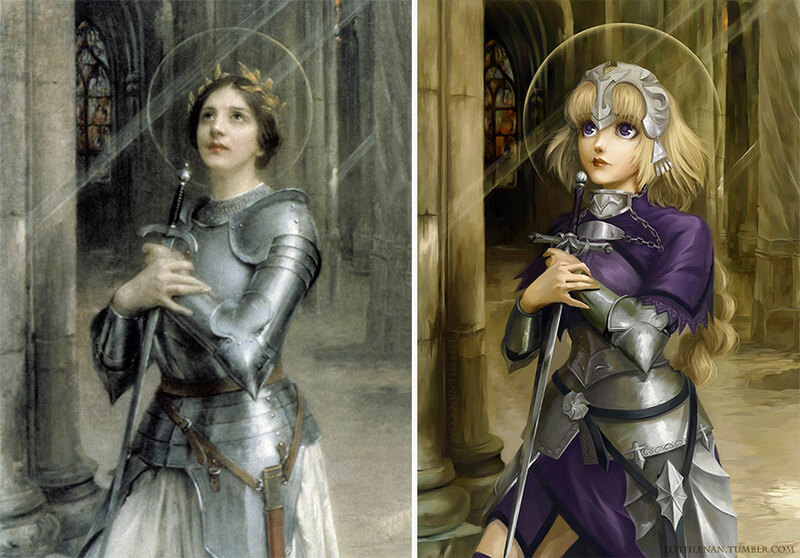 Joan of Arc (Jeanne d’Arc) has inspired artistic and cultural works for nearly six centuries, not least of which is this by Lenoir. Knowing that his parents would not support art as a career, Lenoir became a maître d’études (study master), and then a teacher at a secondary school, the Lycée in Rochefort. It was likely that a taste of formal studies was what gave him a push to follow his heart. He debuted at the Paris Salon of 1887 and continued to exhibit there throughout his life. However, just like many other artists got caught in the change of classical to modern, Lenoir’s art was perceived ‘out of fashion’ before 1926 when he died. 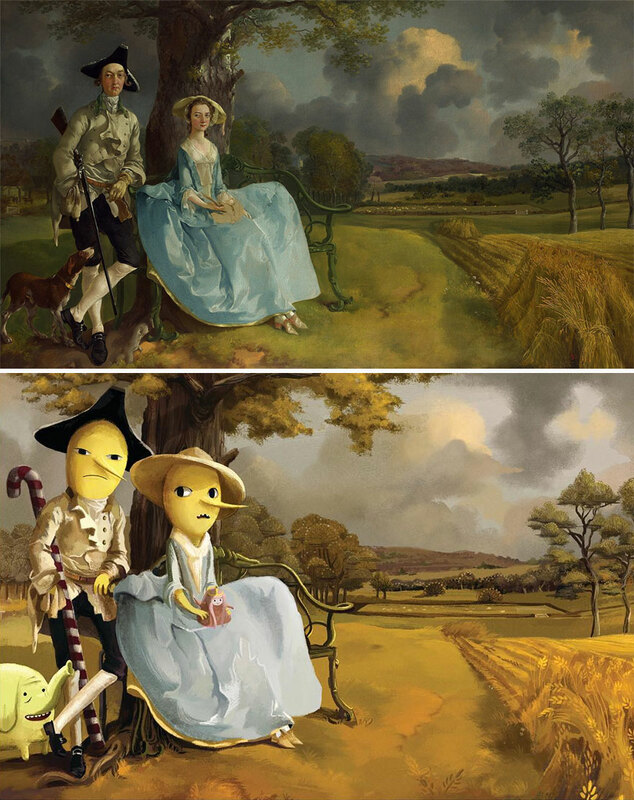 Mr. And Mrs. Andrews is an oil-on-canvas portrait painted by Thomas Gainsborough after his return home from London to Suffolk in 1748. This is a conversation piece, usually a small-scale portrait depicting two or more people, often in an open landscape. By emphasizing on the landscape, Gainsborough was able to put his skills as a painter on display convincingly changing weather and naturalistic scenery, which was still a novel idea at the time. Easily Rank Page 1 for Big Ticket Amazon Products!